HMS Duncan heads to the Mediterranean Sea. TCSG-312 passes by. Royal Navy warship HMS Duncan made an official visit to Romania between 8 and 11 November 2015. 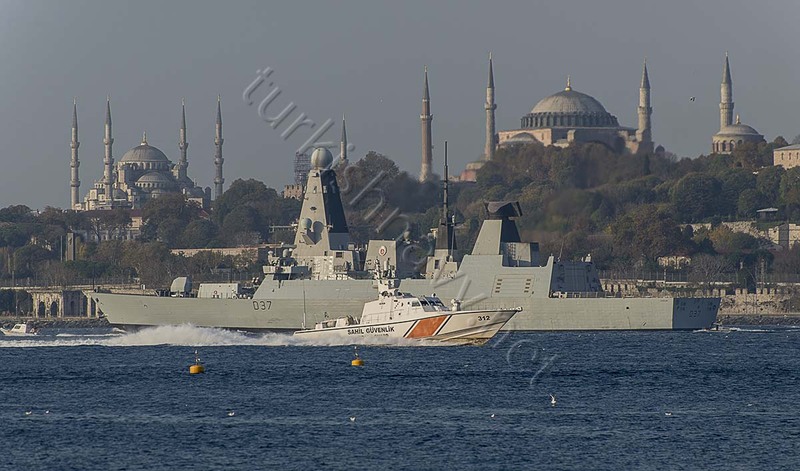 HMS Duncan entered the Black Sea on 7 November and exited on 15 November. The visit of HMS Duncan to Constanta, Romania was not just a cordial visit. The Embassy of the United Kingdom and Great Britain and Northern Ireland in collaboration with the UK Trade and Investment Defence and Security Organization organized 9 November on Board of HMS Duncan an exhibition promoting British defence industry technologies. During the event UK Ambassador Paul Brummell thanked the 13 UK companies participating the event and emphasised that UK companies can provide technology and products that may help Romania to fulfil its ambitious plan to modernise its navy. Romanian Navy currently operates two Royal Navy Type 22 frigates ROS Regina Maria (ex London) and ROS Regele Ferdinand (ex Coventry). These ships were overhauled in UK before their delivery to Romania in 2003 -2004 period. But further upgrade is needed. Armed with only guns and torpedoes these ships lack long-range offensive weapons and adequate air defence systems.